George Buchanan (1506-82) was the most distinguished Scottish humanist of the sixteenth century with an unparalleled contemporary reputation as a Latin poet, playwright, historian and political theorist. However, while his contemporary importance as the scourge of Mary Queen of Scots and advocate of popular rebellion has long been recognised, this volume represents the first attempt to explore the subsequent influence of his ideas and his contested reputation as a political ideologue and cultural icon. Featuring a wide-ranging selection of essays by an international cast of established and younger scholars, the volume explores Buchanan's legacy as an historian and political theorist in Britain and Europe in the two centuries following his death, with particular emphasis on the reception of his remarkably radical views on popular sovereignty and political assassination. Divided into four parts, the volume covers the immediate impact and reception of his writings in sixteenth- and early seventeenth-century Britain; the wider Northern European context in which his thought was influential; the engagement with his political ideas in the course of the seventeenth-century British constitutional struggles; and the influence of his ideas as well as the changing nature of his reputation through the eighteenth century and beyond. The introduction to the volume not only reviews the material in the body of the collection, but also reflects on the use and abuse of Buchanan's ideas in the early modern period and the methodological issues of influence and reputation raised by the contributors. 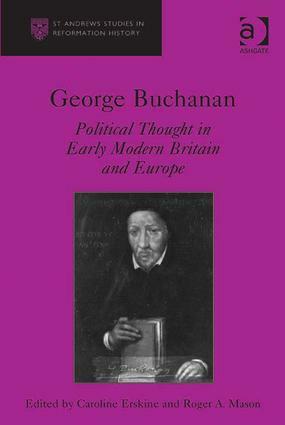 Such a reassessment of Buchanan and his legacy is long overdue and this volume will be welcomed by all scholars with an interest in the political and cultural history of early modern Britain and Europe.